Bitcoin fell below $100 on major exchange Mt. Gox early Friday, dropping under a key psychological threshold. Traders pushed the digital currency as low as $91.50, far below its price at around $537 on two other exchanges tracked by CoinDesk.com. The price on Mt. Gox later recovered to around $100, but it remains the cheapest exchange in the world to buy bitcoin. The price drop followed another update from Tokyo-based Mt. Gox about a technical issue that prompted it to suspend bitcoin withdrawals to outside addresses two weeks ago. Bitcoin had been trading around $850 before the suspension. Protesters outside the Mt. Gox offices in Japan. Mt. Gox is now located on a floor of a Tokyo office tower that is home to a company offering virtual offices. The exchange and the company that owns it, Tibanne, have not responded to interview requests. The situation surrounding Mt. Gox has led some investors to believe it is teetering on the edge of bankruptcy and that bitcoins on the exchange may become worthless. Discussion on Bitcointalk.org, an online forum, touched on the office move, as well as questions about whether Mt. Gox was going to collapse or is a Ponzi scheme, or is intentionally trying to destabilize the digital currency. One participant suggested Mt. Gox is “sabotaging” the currency for someone’s personal benefit. “Some of the price is certainly speculation on Mt. Gox solvency etc., but the withdrawal issue appears economically and numerically dominant,” said Jeff Garzik, a senior software engineer at Bitcoin payment solutions developer BitPay, in an email. Since traders can’t withdraw bitcoin from Mt. Gox they are selling it to withdraw funds in the form of conventional currency, a practice he terms “escape selling.” The opposite situation, where U.S. dollars could not be withdrawn but bitcoin could, existed before on Mt. Gox, Garzik said. The Mt. 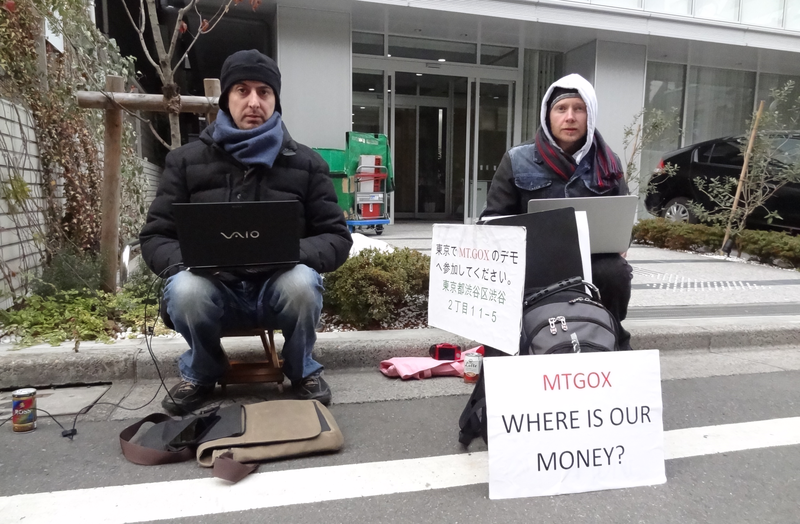 Gox suspension of bitcoin withdrawals prompted a street protest by a few bitcoin traders who had been demonstrating for eight days as of Friday. They have been demanding confirmation from Mt. Gox that their bitcoins are safe. Updated at 10:54 a.m. PT with a video from IDG News Service.